Greetings! Looking for some fun in the sun? Come out and support Tampa Bay's own Young SKAL on April 30, 2017 at 12:00 PM! Go fishing and help our young tourism professionals fundraise to help pay the registration fee to attend the SKAL Annual North American Congress in June in Toronto. SKAL Tampa Bay is sending 3 of its young members to represent the club! Fishing trips run 12-6pm. Meet at noon at Hubbard's Marina where Young SKAL's own, Captain Dylan Hubbard, can be found. Parking at John's Pass is best in the parking garage. Then head to the marina office to check-in. Pre-boarding begins at 12:30. Once on the boat you will be handed your rod and reel and your tackle, or do feel free to bring your own if you're more experienced. This trip is great for people of all angler experience, even beginners. You'll be on the water for 5 hours, 3 of which will be full of fishing about 11 miles from shore in about 40 ft water. The proceeds of the $65 ticket will cover the cost of the fishing trip and over half goes toward Young SKAL. A meal plan with drinks can be bought on the boat, or please feel free to bring your own cooler. PROHIBITED: glass & bananas (for safety & luck).To make your reservation call 727-393-1947 and say Y. SKAL Fundraiser. If you can't attend, please feel free to donate online. Check out this video to show you more about what to expect on this half day fishing trip. If you have questions on tackle, feel free to email Capt. Dylan. And remember, “If you’re too busy to go fishing, you’re just too busy!” Thank you for supporting the next generation of SKAL members! April’s meeting at Florida Aquarium was fantastic! Much thanks to Lorrie Hero, her staff and the Aramark staff for a great evening. It was great to have Gregg Nicklaus back with us and true to his word, he generated excitement with securing the winning bid for The Epicurean package and kicking off the efforts of the next 30 days to assist our Young Skal members on the expenses of attending the NASC in Toronto. We pinned Lorrie Hero (welcome back! ), Angel Hubaykah and Kristina Alspaw Monday evening as new members. Congrats to Angel’s Mom, Tina, on winning the 50/50 raffle! During our May meeting at Bon Appetit in Dunedin, we will be raising funds for our Young SKAL initiative to go to NASC this year with a “rising star” auction like we did last year at the May 2016 meeting at Sirata Beach Resort. As I mentioned Monday night, please send whatever items you can (with values noted) to my attention at TradeWinds or contact a board member that may be close to your establishment for pickup. Our goal is to have 100 items available for the event. We have re-scheduled the First Annual Young SKAL Fishing Trip to Sunday, 4/30/17. Thank you in advance to the Hubbards Marina for working with us so generously on this. 60% of the cost will be donated to Young SKAL. An announcement went out this morning with all the details but in summary, the cost is $65 per person, registration at 12 noon, pre-boarding at 12:30pm and departure at 1pm for one hour of travel each way and 3 hours of fishing. Please RSVP by this Sun. 4/16 if possible so we can assist Hubbard’s with committing to the right vessel and maximizing their booking opportunities. Bring your family, bring your friends, bring strangers and enjoy the afternoon….we can be tourists in our own town for a day! Call 727-393-1947 and use Y.Skal Fundraiser to reserve your tickets today! In closing, I would like to thank Gregg Nicklaus again for enlightening us more on the life and career accomplishments of Pinellas County tourism pioneer, Mr. Sam Johns. Please see below for more details of his contributions throughout his life to SKAL and the Tampa Bay region. 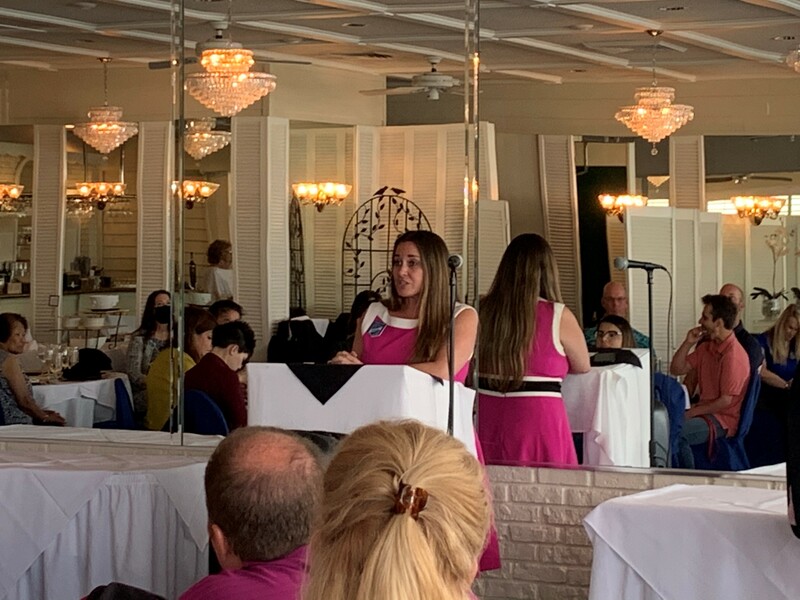 We look forward to seeing you at Bon Appetit on 5/8, plan ahead for 6/12’s meeting at The Bay Club at Westshore Yacht Club and our July lunch meeting and Golf Tourney at Belleair CC on 7/24! It is with great sadness that we announce the passing of Skål Tampa Bay Past President Samuel Charles Johns. Sam passed peacefully surrounded by his family. Sam was a leading force behind tourism in Pinellas County as President of Discover Florida Suncoast and was instrumental in developing Tampa Bay as an international tourist destination. Sam was a longtime member of Skål Tampa Bay, served as President, and was fondly known as “Mr. Skal”. He was our only member to move into a National Skal position where he was honored as President of Skal International U.S.A. (SIUSA) 1999-2000. Hello Everyone…barely getting this one in before March ends! Much thanks to VP Colette Florido for facilitating an excellent, albeit, rainy evening at the impressive Chihuly Collection. I think all would agree that having that venue in Tampa Bay is a big plus and for all those that attended please remember to visit the Hot Shoppe with the tickets distributed that evening. I am sure seeing the action of glass artwork production is equally as impressive as viewing the end product. Eric Blanc, Board Director, pinned Young SKAL member Bailey Morris and we thank both of them for their participation and support. With the help of Capt. Dylan Hubbard, we are working on finalizing the details for re-scheduling the February (weather affected)fishing trip for Sun. 4/30 in order to get it in just before our May meeting which will also be focused on fundraising for possibly up to (4) Young Skalleagues who have shown an interest in attending the Toronto North American SKAL Congress in June. Those details will be out soon separately, so please pencil that day in for a half day trip on Hubbard’s large party fishing boat. We look forward to seeing everyone at the Florida Aquarium on Mon. 4/10! Our February meeting at Embassy Suites USF was fast pacedand full of great content. Holly Powers, President of SKAL International USA attended our board meeting and shared organizational updates with us and also wanted to have me extend an invitation to all of our members to attend the World Congress in Toronto in June 2017 if they are interested and able. It is unique that the event is happening so close to us and as all past participants have shared with me….you really get the “mojo” being among our peers and fellow Skalleagues. It was great to welcome/pin Melissa Silvest, Director of Sales and Event Services at Busch Gardens to the club and we look forward to getting to know her more and possibly arrange a future meeting at her facility. We also presented Kristina Trainer, pinned in January, with the balance of her Skal credentials. Kristina is with Expedia and we formally welcome her to our group as well. 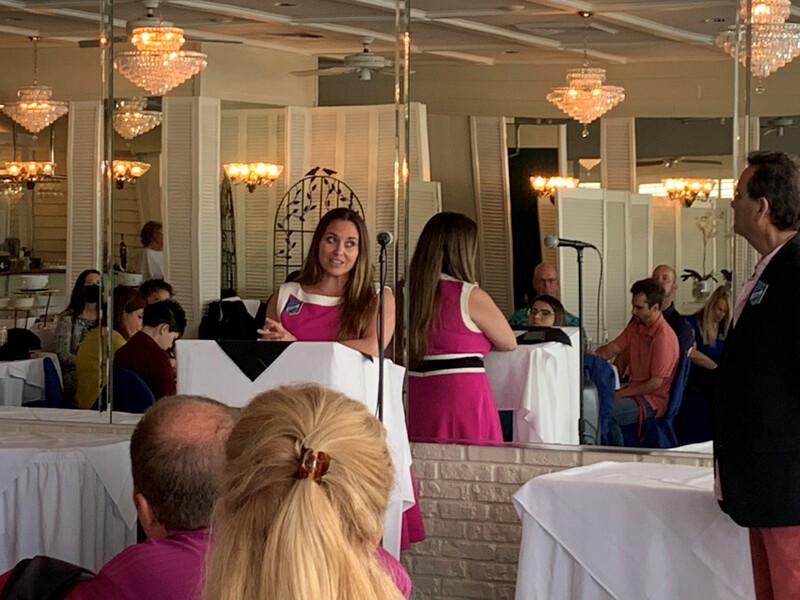 Kimberly Faulk, VP of Sales with Visit Florida presented recent news/updates in Tallahassee regarding the possible de-funding of Visit FL and we have pushed out communication about that to all members. We look forward to seeing everyone at the Chihuly Collection in March in downtown St. Petersburg! Visit Florida Call To Action!! Your chamber CEO, Robin Sollie and Mike Miedel with Pinellas Economic Development represented Pinellas County in today's committee meeting with state representatives. Despite pleas from over 20,000 of their constituents, the Appropriations Committee moved legislation forward that would reduce VISIT FLORIDA funding by 67%. This legislation will be scheduled for a final vote on the House floor. Senator Brandes filed legislation in the Senate that would save VISIT FLORIDA. As we develop the next call to action, please contact committee members listed below that voted to cut VISIT FLORIDA's funding (notice some Pinellas County legislators voted to cut funding). Forward this email to all your contacts and employees to take action. It is important feedback comes from the individuals in the industry. Hi everyone! Ready for some fun in the sun? Come out and support Tampa Bay's own Young SKAL tourism professionals. They've worked very hard to put this fundraiser together to help pay the registration fee per individual to attend the SKAL Annual North American Congress in June in Toronto. Join us Sunday afternoon, February 26th 12-6pm for a fishing & boating adventure. Meet at noon at Hubbard's Marina. Yes, this event in hosted by Young SKAL's own Captain Dylan Hubbard. Parking at John's Pass is best in the parking garage. Then head to the marina office to check-in. Pre-boarding begins at 12:30. Once on the boat you will be handed your rod and reel and your tackle, or do feel free to bring your own if you're more experienced. This trip is great for people of all angler experience, even beginners. We will be on the water for 5 hours, 3 of which will be full of fishing about 11 miles from shore in about 40 ft water. The proceeds of the $65 ticket will cover the cost of the fishing trip and the rest goes toward Young SKAL. A meal plan with drinks can be bought on the boat, or please feel free to bring your own cooler. PROHIBITED: glass & bananas (for safety & luck). To make your reservation call 727-393-1947 and say Y. SKAL Fundraiser. If you can't attend, please feel free to donate towards this cause. Check out this video to show you more about what to expect on this half day fishing trip. If you have questions on tackle, feel free to email Capt. Dylan. And remember, “If you’re too busy to go fishing, you’re just too busy!” Thank you supporting the next generation of SKAL members! 2017 – Off and Running! I would like to thank all members for their continuedsupport of our chapter and I am honored to be the President this year. My maingoal is to keep the momentum going, to visit and experience new venues andpossibly reacquaint ourselves with past venues that have served us well throughthe decades. As George Hoch shared with me last year, our meetings aresort of a “reward” for our years in the hospitality/travel business and thatshould be the message when recruiting potential new members. Funny enough, with the growth of our YoungSkal participants, I see that as another recruiting opportunity as many of usare looking for “the right stuff” for our respective businesses and these youngskalleagues have it….so feel free to add that to the list of reasons toparticipate monthly! Special thanks to Hoyt Hamilton for his service as Presidentin 2016 and hosting our over the top successful December meeting…great way toend the year! I look forward to working with our board members (new andexisting) to create new memories in 2017. Please check the website often forupdates and announcements of our next meeting location in February and thespecial event/fundraiser in the works for Young Skal on Sun. 2/26/17. We are collecting more items for upcoming meetings. We will be mindful of any time sensitive or restricted items but please try to put an expiration date of at least December 31, 2017 on any certificate. Fall is almost upon us. At least that’s what the calendar says! I truly hope everyone is able to put a strong finish on 2016 as we enter the last quarter. A giant thank you goes out to our friends at the Tampa Airport Marriott for hosting us this month. Everything was outstanding! From the cocktail hour and appetizers, to the dinner presentation and dessert. Our market is truly fortunate to have so many outstanding options that serve our number 1 industry! Congratulations go out to our raffle winners: Kathy Fischer won the 50/50 draw while John and Karin Donadeo won a $50 gift certificate to The Sail Restaurant and golf for 2 at Tampa Bay TPC. (Probably should have shaken the tickets up better!) And Tessa Hubbard took home a one night stay at the Airport Marriott. I strongly encourage everyone to get their reservations in for our October meeting at the Opal Sands on Clearwater Beach. It promises to be an evening to remember and if you have yet to see this property, prepare to be WOWed! Please note that this meeting is on TUESDAY October 4. Not our normal Monday. Looking forward to seeing everyone at the Opal Sands! Thanks go out to everyone who attended our June meeting at the historic Columbia Restaurant in Ybor City! While our monthly meetings are always fun and memorable, being at this venue was truly an experience. The Gonzmart Family and their staff did an excellent job of providing us with plenty of drinks, and a dinner that can only be had at the Columbia. Thanks again to all! A VERY special thank you goes out to our Membership Committee. Roberta Blum, Rick Hamilton and Tom Haines were able to invite over 20 new guests for the evening and it is now everyone’s job to work towards making them welcomed members in the near future. Congratulations go out to our Raffle winners: Chris Heye /Dolphin Watch Cruise, Dominic Provesano /Brunch for 2 at Belleair Country Club, Julie Cortina /South African Wine and SKAL Bag and Dylan Hubbard was our $150 50/50 winner! Well, the humidity of summer has officially arrived. And that can only mean one thing, it’s time to play some golf! Everyone please mark your calendars for July 22, 2016 at the beautiful Belleair Country Club for the Annual Don Smith Golf Tournament. Tee time is 8:00 AM and lunch will be served shortly after 12 Noon. Looking forward to seeing everyone’s picture perfect swing on the 22nd. Everyone should have received an email informing you of Ed Shaunessy’s charity project and I urge everyone to bring something for Ed to the Golf Tournament. Meetings are typically held the second Monday of each month with some exceptions: July is our annual golf tournament and August is our Region IV Congress which is rotated between the clubs in our region. Meetings are also typically dinner events with a 6:00 reception followed by a 7:00 dinner over by about 9:00. Attire is business casual unless otherwise stated due to the venue. During a typical meeting, the reception time is a great opportunity to mingle and make new SKAL friends as well as welcome and get to know our guests who are potential members and share your great SKAL experiences. As a member of SKAL you have the opportunity to spend time among like-minded professionals, to enjoy fabulous cuisine at some of Tampa Bay’s finest venues. It is not the time or place to pass out business cards or hustle business. You will of course make lifetime friendship and if at some time you decide you need one of the services a member provides, you will of course call on them for their expertise. When we do our SKAL Toast, only members should stand for the toast while their guests remain seated. We have two special events each year: Our holiday party in December and our Installation Dinner in March. Suggested attire is more formal with Black Tie optional. While members are always welcomed to sign up their spouses to attend a meeting, the two special events are typically a big draw. Members are encouraged throughout the year to invite guests who are considered to be “qualified” potential members. These are upper level, hospitality industry executives. SKAL draws from hotel executives and owners, Travel and Cruises industries, Attractions and transportation to name a few. If you are not sure if your guest qualifies you may contact your Membership Committee Chairperson, or our EST. If the potential guest qualifies, please invite them to their first meeting as “your guest” rather than stating it is free. Our May dinner at the Sirata Beach Resort was a huge success for a number of reasons. The Sirata always delivers a memorable evening and this was no different. From the Cocktail hour on the Breezeway with delicious appetizers, to a wonderful dinner that was only surpassed by the spectacular views of the sunset. Somehow that never gets old! I would also like to thank the Banfi Winery for supplying the wine selections. They were a perfect complement to the meal. A big thank you goes out to Gregg Nicklaus and Tim Coultas for an outstanding evening. I want to thank Laura Lothridge and Ronda Sanborn for organizing and conducting the Stars of Tomorrow fundraiser for our Young SKALs. Their efforts raised over $500 for our young SKAL program. This will go a long way towards providing these future hospitality professionals with the opportunity to be a part of, and learn from, our club members as they grow within our industry. I urge all members to keep your eyes open for potential new Young SKAL candidates that may be in your company, or that you interact with in your daily routines. This is the future of our club, and industry, and your help makes everyone stronger. All of us are encouraged to be aware of prospective new members and this month, George Hoch and I were happy to pin Robert Czyszczon with Plaza Beach Resorts as our newest member. I have no doubt that Robert will be a big asset to our Club! Congratulations, and a big thank you goes out to Leslie Wright. She was the winner of our 50/50 drawing and selected a 2 night stay at the Barefoot Beach Resort as her prize which allowed us to donate the cash winnings to the Young SKAL program. The June dinner will be on June 13th at the historic Columbia Restaurant in Ybor City. It is sure to be a night you won’t want to miss so get your reservations in early. I look forward to seeing everyone there!